Maine has many award-winning ski resorts and ski hills, but for those who prefer not rocketing down a mountain on a pair of skis, there is loads of incredible cross-country ski trails in Maine. Here are our 10 favorites. Bethel Nordic Ski Center is in the center of the classic small Maine town of Bethel. Located not far from Sunday River Ski Resort, the trails wind through the golf course and the nearby forest for a total of 30 kilometers of well-groomed trails. Carter’s X-C Ski Center has two locations in western Maine. Their original center is located on Route 26 in Oxford and their second center is just a few miles from Sunday River in Bethel. The Oxford location has over 40 kilometers of groomed trails that range in difficulty from beginners to the immediate skier, whereas, the Bethel location is slightly larger with over 55 kilometers of trails for the beginner to the advanced skier. Pineland Farms is home to over 5,000 acres of pastureland and forests for various outdoor activities year-round. During the winter months, the trails are open to the public for skiing, sledding, and snowshoeing. Pineland has over 30 kilometers of professionally-groomed trails open to both classic and skate skiers. Pineland has a well-stocked rental shop with rental packages for both classic and skate skis. Located in southern Maine, Harris Farm is home to over 40 kilometers of trails through pastures and woods. Trails range from flat beginner-friendly trails to more advanced trails with rolling hills. About 30 kilometers of the trails are groomed for skate skiing while over 35 kilometers are tracked for classic skiing. Five Fields Farm is in the picturesque town of Bridgton near Shawnee Peak Ski Area. During the warmer months, Five Fields Farm is an active apple orchard and during the winter months you can ski through the orchard and take in the views of the western Maine mountains! Over 25 kilometers of groomed and backcountry trails are available for beginners to advanced skiers. During the winter months Smiling Hill Farm grooms over 25 kilometers of trails winding through their vast pastures and woods. Trails are tracked for classic skiing and wide enough for skate skiers. Smiling Hill Farm is just a hop, skip, and a jump from Portland so it’s one of the closest trail systems to the city. Bradbury Mountain State Park is a state park located on Route 9 in Pownal. The state park is a popular summer destination for hiking, but it is equally great in the winter. The park is home to miles of trails that range in difficulty of steep climbing up to the top of the mountain to nice wide trails across the street. Trails open to cross-country skiers include: Boundary, Northern Loop, Ski, Switchback, and Tote Road. Libby Hill Trails is a great network of eight miles of widely groomed trails open to the public daily for free. Trails vary on difficulty as the area is rather hilly, but they are open 24/7 during the winter months so you can easily do a night ski, just be mindful of neighboring homes. The Fort Kent Outdoor Center was opened in 1999 and has hosted multiple national and international Nordic and biathlon events. The three-kilometer ski loop is one of the best in North America. There is a full-service cross-country and snowshoe shop on site. The Nordic Heritage Center is the jewel of the crown of Maine. It has hosted many international ski events over the years, including the 2010 USSA JO National Championships. The center has over 20 kilometers of world-class cross-country trails designed by John Morton of Vermont. 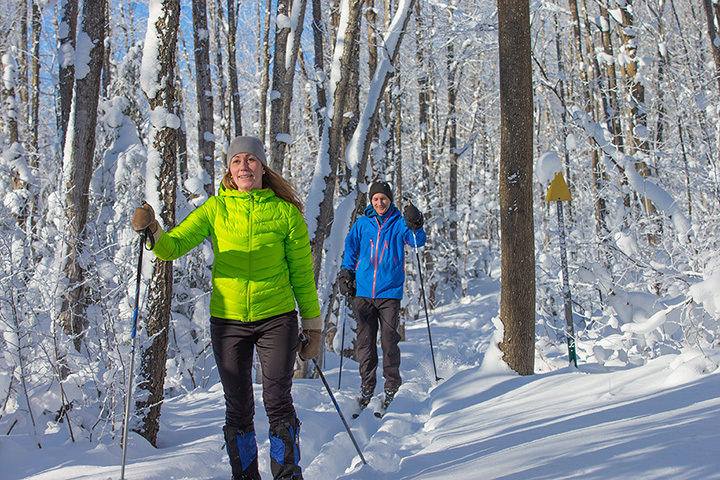 View more Maine Cross Country Skiing Trails.